On the heels of the success of Netflix original series like the excellent David Fincher/Kevin Spacey political thriller House of Cards comes the supernatural horror-drama Hemlock Grove from actor-director and splat pack member Eli Roth (dir. Hostel 1 and 2, Cabin Fever, actor in Inglorious Basterds). 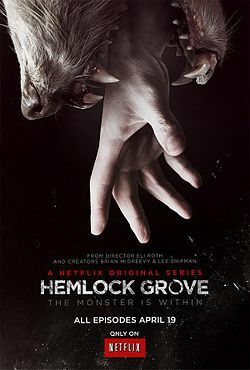 While not always the biggest fan of Roth's work I'm keen to see him take on the supernatural and with Famke Janssen, Lili Taylor, Bill Skarsgård (god there a lot of those kids, Stellan keep it in your pants buddy) and music by Hans Zimmer protegé Nathan Barr (composer on HBO's sweaty and bloody True Blood) I'm on board.